Join the community to receive occasional emails with pretty photos of horses, updates and specials. Our hoofbeats are many and our hearts beat as one. The Bond you Share is Magic. Let me capture it for you. 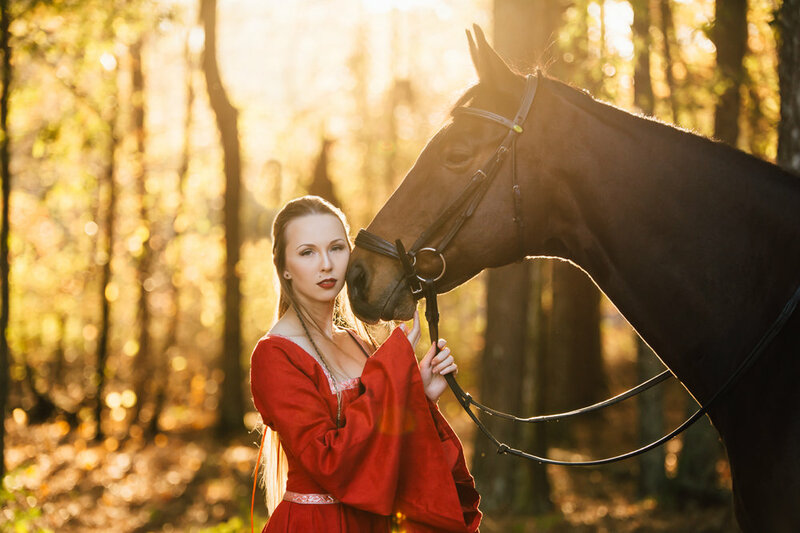 These portrait sessions are designed to capture the incredible bond you share with your horse and create beautiful works of art that you will cherish for the rest of your life. These sessions give you total control of the experience - location and styling are chosen by you. Each session is fully guided for a variety of poses that showcase you, your horse, and the nuances of your relationship. I believe that photos should be printed, looked at and loved every day - not just on the computer. Every session includes a custom keepsake box and prints for you to enjoy in your daily life. Sessions start at $350. Click here for a PDF with more information. Contact me to book a session. Mini Sessions are essentially group sessions, perfect for friends or barn buddies who want to split the cost and time of a session, or for employee photos for a barn. Mini Sessions require a minimum of 4 30 minute slots to be booked, and multiple slots may be booked by a single person if they have multiple horses or want additional time and photos. Mini Session Hosts/Organizers receive discounts toward their mini session time. If you are interested in hosting or organizing a mini session, get in touch! Mini Sessions start at $200. Click here for a PDF with more information. Contact me to schedule. Make your first impression a good one! Great photos are required if you want your horse or stallion to stand out from the crowded market. If you are selling your horse or stallion services, this shoot is for you. Equine Sales sessions start at $200. I am available to shoot single-ring events like schooling shows, dressage shows, clinics, drill team events and inspections. I have lights and can work with nearly any lighting situation. Contact me to inquire about event photography.